Taking a backup of your web properties is always necessary when you have your career running with it, and the online business is quite risky because there is no guarantee that your website / blog would stay on always and there are hundreds of reasons for it going down. One of them is the web host where you have hosted the blog. Also, if at all the web hosting company has taken your site down due to any objectionable content or flagging by someone else, they usually won’t be able to restore the website, so having a backup regularly taken is the best way to keep the blog safe. WordPressBackup plugin for WordPress is one of the simplest and easy-to-use option for the bloggers to take the backups of the WordPress blog, and this is one of those which doesn’t need much of the knowledge because there is a simple option for scheduling the backups of the wordpress blog, and one can even select between the wordpress data or all the files or both. 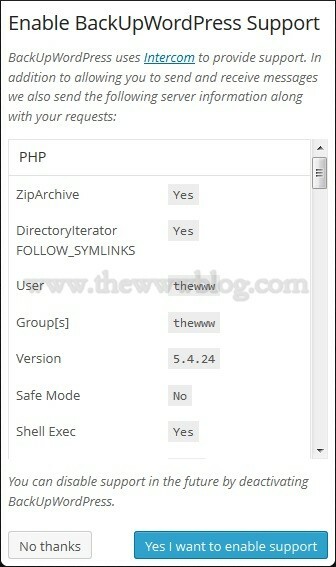 Here’s how you can use the plugin and take regular backups of the WordPress blog – Install the plugin, either by downloading from the plugin repository and uploading it, or by going to Plugins > Add New and search for “WordPressBackup” and installing directly in the WordPress admin panel. Once you set that you, the settings section of Backup would be seen in the “Tools” section in the sidebar. Once the plugin gets installed, it would automatically set a schedule for the backups, and you can click on “Settings” to change the time and type of backup. You can select whether to backup database, file or both together and the scheduling can be done either for hourly, twice daily, once daily, once weekly, once fortnightly and once monthly. If you wish, you can set that to manual and take backup whenever you wanted, but it is always better to schedule the backups. You can start the backup right away, and the database is dumped and backup is taken. You could choose to either delete the backup or download it to your local hard drive for any other use. The BackupWordpress plugin even provides support and for that, they use Intercom so that apart from the sending and receiving of the messages, there would be all the server information sent, and you can wish to have this enabled or disabled based on your privacy. Once enabled, you need to disable the plugin to disable the support. So, this was the BackupWordpress plugin for WordPress which you can download from the link – WordPress.org.